I was lucky enough to catch the last performance of the blink-and-you'll-miss it run of the regional premiere of Vincent River by English playwright Philip Ridley, in fact just the second US production. The play was independently produced by multi-talented #TCTheater artist Grant Sorenson, who also directed. You might remember Grant as one of the founding members of 7th House Theater Company, or in performances at various theaters around town. He notes in the program that when he recently re-read this play that he first experienced in college, he felt that he had to make it happen in the Twin Cities. And that's why this is such a great theater town; he called a few friends, secured some donor support, found a venue, rehearsed for a few weeks, and happen it did! 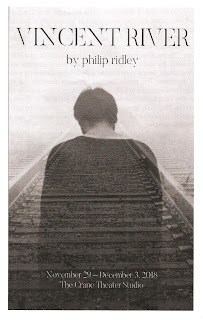 Written in 2000, this play about a mother grieving her (unbeknownst to her) gay son murdered in a hate crime is sadly still relevant (see also Uprising Theatre's recent production of The Laramie Project for the 20th anniversary of Matthew Shepard's murder). It's a difficult play to watch, but beautifully and smartly written, and beautifully produced by Grant and his team despite the limitations of time and budget. In this two-person play, we meet Anita as she's returning home from an errand, and invites the teenage boy who's been following her for months into her flat. She knows that it has something to do with her son Vincent, brutally murdered a few months ago in an apparent hate crime. Davey tells her that he's the one who found her son's body, but it's obvious to everyone that there's more to the story than that. In this 90-minute conversation, we learn more about Anita, Vince, and Davey. They dance around each other, deciding how much they can trust the other, and eventually share things with each other they've never shared with anyone. Anita is hungry for any details about her son's death, and Davey is haunted by the memory of Vince. After a lot of painful discussion, and not a little gin, the two achieve maybe something like the closure they were seeking. But they will obviously always be grieving, and always be connected to each other by Vince, even as they go their separate ways after this life-changing encounter. This is the second show I've seen at the Crane Theater's intimate studio space (to which they've fortunately made some improvements to deal with the sound issue with the main theater). By virtue of the space - a small rectangular high-ceilinged room with space for just 20 or 30 seats - theater has a raw, intimate, immediate feeling here. As does this play; it feels like we're eavesdropping on this intense conversation, almost uncomfortably close to the action. There are no tricks of lighting, sound, fancy set pieces, or distance for the actors to hide behind, and fortunately both #TCTheater vet Laura Esping and new-to-me Cole Seager are up to the task. They're both so in it, and go to places of deep pain and vulnerability; true partners as they listen and react to each other. It's almost breathtaking to experience theater this real and visceral. Makes you want to see the play, doesn't it? You're out of luck for now, but hopefully Grant will continue his work, possibly starting a new theater company (since half of 7th House is NYC now). In the meantime, I'm glad I was able to witness this heart-wrenching and beautiful play.